Golf clubs, the length and breadth of the UK, are hotbeds for debate. Go into any clubhouse on a Saturday afternoon and you'll find people arguing the virtues of links golf over parkland or Stableford over medal play. Every time a golf magazine produces a top 100 courses list, golfers throughout Britain begin quarrelling about its inclusions and omissions. 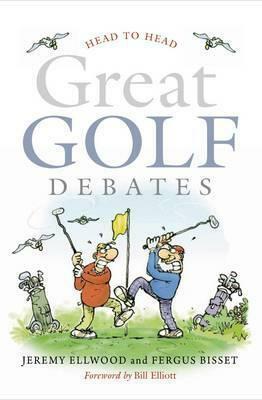 In "Great Golf Debates", Jeremy Ellwood and Fergus Bisset look at forty of golf's most disputed issues from the serious to the more light-hearted, examining them from opposing viewpoints in an entertaining yet informed manner.From 'Tiger Woods vs Jack Nicklaus' to 'Pull carts vs Carry bags' they provide convincing arguments to give supporters of both camps some added ammunition, appealing directly to every British golfer's argumentative nature. Writers for "Golf Monthly", Ellwood and Bisset's 'head-to-head' style debate features regularly in the magazine and has been a fabulous success in generating considerable interest both in letters to the magazine and debate on the "Golf Monthly" website where a poll is conducted. The section's popularity gives clear indication there are many issues that split opinion between Britain's golfers and that this book seeks to address a selection of the most contentious. Jeremy Ellwood is Golf Monthly's associate editor and has been with the magazine for five years. He has written on a broad range of golf-related topics from travel and course reviews, to in-depth features and player profiles. He has also written for The Independent, The Mail on Sunday's Live Magazine, Pro Shop Europe and Golf News.Fergus Bisset is Golf Monthly's contributing editor. A freelance writer, he has worked with Golf Monthly for the last three years. He has also written for Total Golf, The Mail on Sunday's Live Magazine, Sky Magazine and Square Mile Magazine. Hailing from Aberdeenshire and having attended University in St Andrews, golf runs through his veins.